Thank you for a great World Diabetes Day! Good morning everyone. This week I want to extend a huge thank you to all the visitors who didn’t let the cold weather stop them from celebrating World Diabetes Day with us. It was great to see Banting House National Historic Site of Canada filled with people. I enjoyed answering your questions about the museum, as well as serving hot chocolate and cake. I was honoured to have the opportunity to read one of the letters that a museum patron left for Dr. Banting. The letters, many of which were written in languages other than English, were a compelling reminder of the global impact of diabetes, as well as the legacy of Dr. Banting’s discovery of insulin. We are also extremely proud of the students, both in London and elsewhere in Southern Ontario, who raised money for diabetes awareness and who were an important part of our World Diabetes Day celebrations. When the ceremonies were over, I got to plug in the lights and voila! Banting House became a Blue Monument. After weeks of planning, it was wonderful to welcome all of you and see this event unfold. So what were we up to before our guests arrived? As you might expect, I went to the museum well before 6:30 so that I could help prepare for the event. Apart from getting tents and tables set up and ordering blue lights, I helped Grant install the last few panels in our exhibit, “Advocacy in Action – Who Are You Fighting For?” The brand new exhibit was very well received. Several visitors have already written on our central panel. (If you haven’t already, I encourage you to see the new exhibit and leave your own personal message!) We were also happy to have guests at the museum as we were setting up; a film crew from China came to shoot scenes of our World Diabetes Day activities! Overall, I would say that this special event was a success. This was my first year participating in World Diabetes Day. I’m already looking forward to next year! 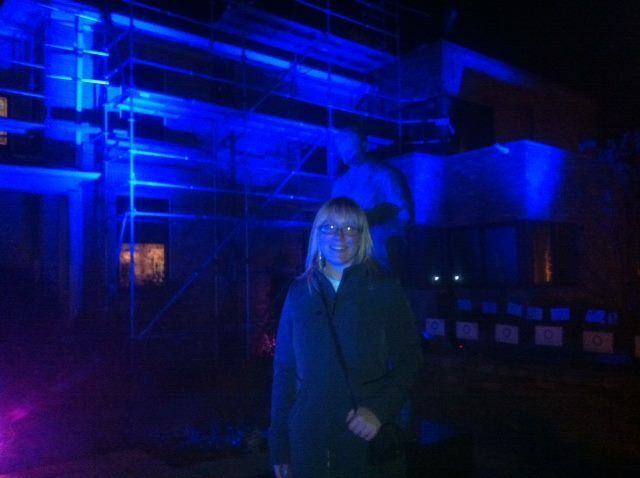 I’m standing with the statue of Sir Frederick Banting as we turned the museum and Sir Frederick Banting Square blue for World Diabetes Day. Posted in Behind the Scenes at Banting House, Museum Happenings and Events.Tagged Dear Dr. Banting, Diabetes, Event, Events, Exhibit, Exhibits, London, Museums, Sir Frederick G. Banting Square, World Diabetes Day.